Well it usefully because some if the people in who reversed engineered the itho signal are there. If have asked for help there in the hope that they can provide the info to fill in the signal specifications homey needs to send and receive the itho signals . So I really hope we can get some help there. The signal specification really is it my field of expertise . Writing an app is reasonably easy, but interpreting the data that they provided and getting the info needed for homey is not doable for me. I don't no if I am right but I what I understand is that not al 868 MHz chips are the same. You need a special one. But please correct me if I'm wrong. And if so, i don't now if homey has the correct one. unit to control it with domotica/homey/zwave. Or Have an idea to control it? What kind of article number does your RFT transmitter (see attached documents) have? If I am correct, there are at least 2 protocol versions and the software only supports the newer version. By the way: At the bottom of this https://developers.athom.com/library/signals/rf/ page it says the mentioned receiver configuration cannot be changed by a developer so this may be a futile excercise. The Brink Renovent Excellent wtw is able to use Opentherm communication according to its manual. Parhaps you can experiment with an Opentherm Gateway http://otgw.tclcode.com/? I am wondering if there is any progress on the development of an app to control the ITHO ventilation box. I still think it can be done since the Homey is using the same chip as the projects found on the internet. So the cop is capable. If the Homey API is I still have to find out. But saw that there is now also a HoemEasy app in the tire. So will see if there are some useful tips and tricks in there. @Annemarie Does Athom have any plans on developing an app to control the ITHO Ven box? There are some code repositories we can find online (here and here), but they need some adjustments to make it Homey specific. I also would like to control my ventilation unit through Homey. Is there anyone that has a Orcon MVS-15RH. They have a remote that works on 868.3 mhz. Internet search has led me here. I also have a Itho ecofan I would like to control via RF. would certainly donate the appbuilder. While it would be great (and the ultimate goal) to get Homey to control the Itho directly, the nodemcu (a small Arduino variant with WIFI) + CC01 RF chip combination described at https://www.maredana.nl/itho-mechanical-ventilation-with-esp8266/ works really well. The hardware can be bought for ~8 euro's on Ebay. The most difficult bit is to wait for the cheap components to arrive from China (free shipping, but it takes a month... ). As mentioned above the nodemcu comes with a WIFI chip. After connecting (soldering) the C1101 RF transmitter chip and uploading the software through the Arduino IDE you can connect the unit to a USB power supply anywhere and control it through WIFI via a builtin webserver (see screenshot below). The software includes support for a temperature / humidity sensor (another ~5 euro's or so, available in most electronic stores), so you can use it for instance to control the humidity in the bathroom by switching the Itho fan to 'high' when the humidity reaches a certain threshold (which is what I use it for). It can also receive RF commands sent by other Itho remotes in order to track the state of the Itho fan. The author has made a neat web interface for controlling the Itho Fan, see below. I have the modified the code to update Homey with the temperature, humidity and state of the fan through http POST messages using the HTTP request flow cards and better logic app. The better logic app tracks the value of the temperature and humidity variables, resulting in nice graphs (see below, the green line is humidity, the darker line is the temperature). Homey can control the Itho unit through HTTP GET requests. Based on http://www.progz.nl/blog/index.php/2015/01/reverse-engineering-remote-itho-cve-eco-rft-part-3/ I think the 'words' in the 'signals' definition in app.json should be 254 (0) and 255 (1), corresponding to 0b 1111 1111 1111 1110 and 0b 1111 1111 1111 1111. Any progress/news on controling the itho ventilator directly or any way of copying the signals from the remote? In the meantime it turns out that by default Homey listens only to ASK (amplitude modulated) 868 MHz signals. The Itho signals are FSK (frequency modulated), which is why the data received by Homey looks so random. Homey can send FSK and receive FSK two seconds after sending. In an upcoming release the possibility to enable Homey to receive FSK signals and display them on the console will be added. When that's the case I will probably have another look at the app. Note that this also means that it will not be possible to have Homey track that state of the ventilator by receiving the signals when using the remote. Not a big deal, but it's nice that the Itho Wifi remote can do this. 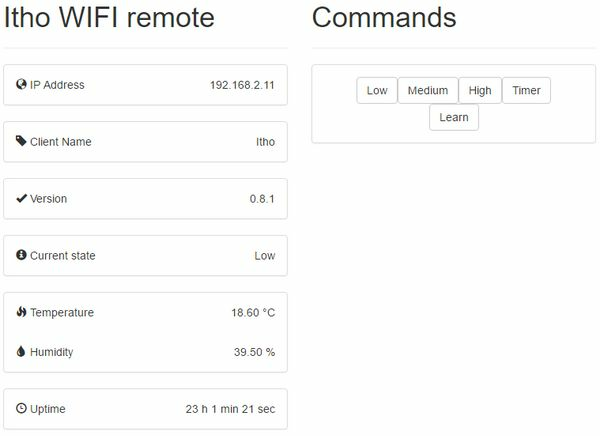 BTW, I have published the Homey version of the Itho Wifi remote on github: https://github.com/abaretta/Itho-WIFI-remote-Homey. Nice progress on understanding how it works. Would love to see an app later. @anne is it possible to create a how to. And post the links to the devices that we need. I'm complete noob don't know where to start. I could put together a unit for you, however I wouldn't want to provide support on the hobbyist stuff I produce And I have plenty of other stuff to do, sorry. However, it is a fun project to do yourself, and I can definitely help out in case you have questions. Instead of using the Arduino sketch linked from that page you can use the one I created for use in combination with Homey: https://github.com/abaretta/Itho-WIFI-remote-Homey. You also need the C1101 RF chip. Make sure you get the 868 MHz version. For instance: http://www.ebay.nl/itm/2PCS-CC1101-wireless-module-Long-Distance-Transmission-Antenna-868MHZ-/172009556160?hash=item280c9188c0 (2 pc for USD 6.16). I bought both at Ebay from http://stores.ebay.nl/satisfyelectronics/. I also have good experiences with banggood.com, see https://www.banggood.com/search/nodemcu.html, however they don't appear to have the CC1101 at the moment. I did buy a small enclosure for the unit there: https://www.banggood.com/search/948279.html (I think the smallest, not 100% sure). 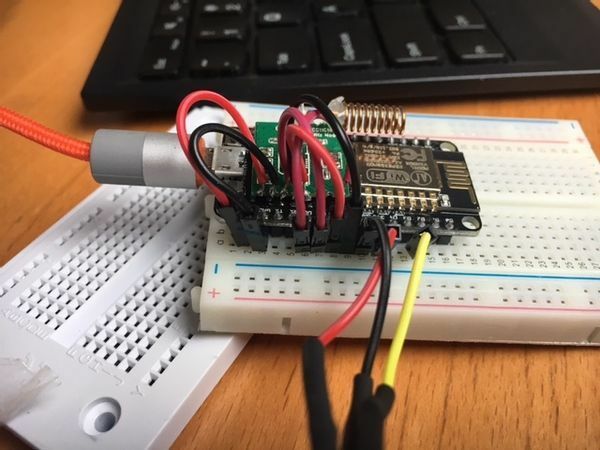 You will need a small breadboard for the NodeMCU, and some wires with connectors to connect to the NodeMCU pins (all items can be bought in the eBay store above). I soldered the wires to the CC1101 chip, but used connectors to connect them to the NodeMCU. A glue gun will come in handy as well, I glued the CC1101 straight to the NodeMCU and used it to to support the antenna as well. I bought the temperature/humidity sensor 'ready made' with a cable and a small enclosure around the sensor, it was actually the most expensive part. I bought it in a Dutch electronics webshop, can't remember which one. Once done (hardware assembled and Arduino sketch loaded), you will need to power off the Itho unit (pull the plug ;-) ), and after powering it back on start the NodeMCU. If the Itho goes to full power mode you are done. You can now control it via the web interface and via Homey. I trimmed the breadboard and crammed everything in the plastic enclosure (see picture in previous post), it looks nice with just the USB cable and the cable for the sensor sticking out. It works great, one nice detail is that it also receives the signals sent by Itho remotes, so it can update Homey with the actual state. An eventual Homey app will not be able to do this, as it can only listen for Itho signals 2 seconds after sending. I have just ordered the hardware. I hope it is the right one . But didn't order that one. I saw that someone working on Xiaomi sensors and want that one in de bathroom so that I can place the NodeMCU can be placed on a safer place. I have never build some thing like this so I hope it's all gonna work. And yes, that's the one! A bit ridiculous to think that the simple sensor is 4 times as expensive as the entire NodeMCU. I didn't want to wait for another shipment from China, and liked the finished product. I only put some heat-shrink tubing around the leads of the sensor. DHT22 sensors can be found much cheaper, but then you need to do something to make it more rugged/presentable. If I read the new V2 SDK properly Homey will now allow listening to FSK signals. Would that help @anne? It will only become available with version 1.5 but would that be a good moment to give it another try? I've tried connecting a KlikaanKlikuit to an Optifor PCB via the bathroom switch - this is not recommended. This would definitely be a great addition to the Homey possibilities! Like half of all houses built after 2000 have such a unit upstairs. Would greatly impact the yearly power usage and oxygen level in doors. Now that 1.5 has been released, is there any news on this subject to control the itho directly from the Homey ? It is not clear when this functionality will be released. Possibly it will be made available as part of the developer tools (at some point). Are you saying this is a software limitation of Homey and in the end it will be possible to use Homey directly to control your Itho ventilation system? All we need is patience and perhaps some stimulation of the people at Athom?